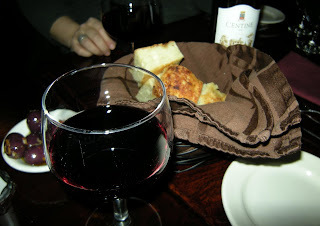 An Intimate Experience With Friends at The Tuscan Grill in Waltham, Massachusetts. There are very few places you hear about these days from 1600 miles away, places friends tell you that you must detour for, things they say are worth a trip in themselves. The Tuscan Grill is such a place. I can honestly say I've heard from people on both coasts about it. And that's saying something, since my friends tend to have pretty refined tastes. Not 20 seconds after I let my good friend Louis Garcia know I was coming to Boston for an assignment, he told me we had to go to the Tuscan Grill. Before any of the attractions. Before any of the activities. He simply insisted this was the place I had to go. The night before I left Little Rock, my friend Damon Brown came over to see us and our friends. He was making a circuitous route around the United States before heading back to Los Angeles. He told me straight out I had to go to the Tuscan while I was in town -- and shared with me his ethereal experience with a venison dish. Well, that cinched it. I had to go. My husband and I joined the Garcias for dinner one Friday night in January. We arrived for an 8 p.m. reservation. The two rooms were packed, but our waitress lead us to our designated table -- a nice four seater near the front tucked in near the center of the restaurant. We perused our menus and oggled the offerings. Our waitress came by, and our hosts ordered a Centine Banfi -- a combination of merlot, Sangiovese, and Cabernet Sauvignon that I was assured would go well with anything we ordered. We also went for an appetizer -- handmade Wild Boar Sausage served with lentils in olive oil. Our waitress brought us fresh hot bread from the kitchen -- coarse bread that tasted of butter and herbs and which could easily have been a meal in itself. Our wine came out with the bread, and I was shown how to carefully take in the aroma and properly savor the blended beverage. These offerings were accompanied by a small bowl of wine pickled purple olives that were surprisingly tart. The Tuscan Grill has been a mainstay of Waltham's Moody Street for the past 16 years. The owners came from northern Italy and... well, Northern Italian food is what they wanted to serve. A very good choice, if I might add. The executive chef, Jason King, works up the menu seasonally. It's completely changed out every spring and fall, and tweaked for summer and winter. The items are determined by what's fresh and available at that particular time of the year. Certain allowances are also made for new foods and ideas -- for instance, using wild boar instead of traditional pork, or choosing organic products. Our Wild Boar Sausage came out -- two sausage balls on a bed of soft lentils that had been cooked in olive oil and, apparently, the drippings from the sausage. The sausage itself was very lightly spiced and pretty good, but the lentils? Oh, my goodness. They were the perfect accompaniment, and really good even on their own. We ordered our entrees and spent time talking and enjoying each other’s company. It was good to get to sit back and relax. There’s no hurry at the Tuscan Grill -- a fact I much appreciated. We lost ourselves in conversation -- and soon found ourselves presented with bold plates of our ordered dinners. Each of us in turn sampled our dishes and shared the experience. Each in itself was quite a spectacle, but together we had the makings of a rich repast that was not close to being equaled in casual settings. 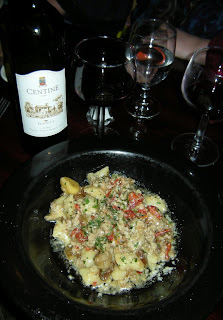 Our friend Louis had the Gnocchi, Housemade Sausage, Raisins, Sundried Tomatoes, and Chestnuts in Garlic Butter Sauce ($17) -- a hearty, filling yet varied creation that was both savory and sweet. The salty sausage struck harmonious balance with the tart of the tomatoes, the crunch of the chestnuts, and the sweetness of the raisins. His wife Dee savored the Wood Grilled Cobia, one of the day’s specials. It was cooked with pumpkin seeds and served over greens with balsamic vinaigrette. She said the fish was very crisp on the outside, with perfect soft flesh within. The firm whitefish was counterbalanced nicely with the tangy vinaigrette. 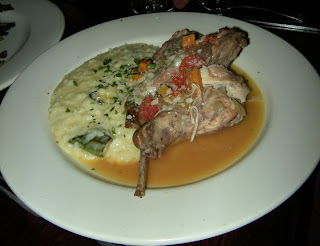 My husband Paul went for the Braised Rabbit and Roasted Baby Vegetable Risotto ($20), a half of a rabbit that came out couched on the edge of a circle of garlic Parmesan polenta and a crescent of its own gravy. The juicy critter was very tender and not the least bit gamey. It was herbed and cooked with delicate vegetables. Paul says he’s never had more perfect rabbit. wow. The chef chose to understate rather than overstate the seasoning on the veal, allowing a generous and delicious cut to shine on its own. The flavor had soaked straight through -- and was evident even and especially in the marrow, which I consumed with relish -- okay, no real relish, just my own exuberance. I appreciated the choice of polenta over the standard mashed potatoes that traditionally accompanied red meat -- and even enjoyed the Cavalo Nero. In fact, there was something amazingly Southern about this Northern Italian dish. For really -- how far was it from my grandmother’s beef steak, Collard greens, and grits? On the surface, not far. By taste? Eons away. Each of our portions was geared at a single diner -- this is not a place where you have to ask for a take home box. 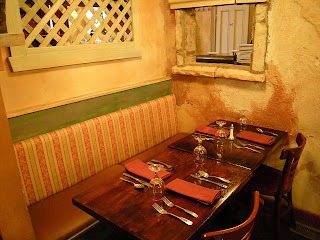 Rather than overwhelming with quantity, the Tuscan Grill delights with quality, and it certainly delights a lot. Of course we ordered dessert. And with our desserts -- aperitifs, except for Dee who was driving. She asked for a cappuccino. The conversation started to slow in the way good conversations do when you’re enjoying good company and are filling up on good food. Our second bottle of wine was almost drained. 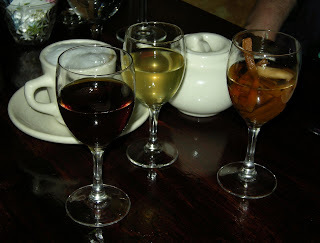 Our aperitifs and cappuccino arrived together just moments before our desserts. Paul chose an apple and cinnamon grappa, which came with slices of apple and a cinnamon stick. He said it smacked him in the palate with the heady scent of cinnamon. When he took a little into his mouth and breathed in, the flavors exploded on his tongue. He was quite happy. Louis was quite pleased with his thick fig grappa, which clung to the side of the glass like the richest amaretto. My own choice, the lemon liqueur, was a housemade liquor, a vodka base lightly sweetened and macerated with lemon peel. It was delicate and light -- which was perfect, since my dessert was also light after my heavy meal. Our desserts were delivered with gusto. 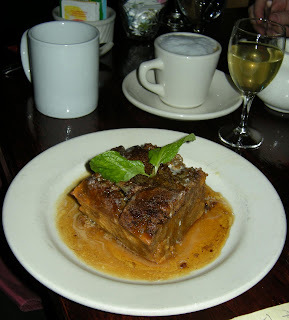 We all marveled at the size of Dee’s Pumpkin Gingerbread Pudding with rum sauce. It was heady with its own richness, and mated well with her coffee beverage. The ginger and pumpkin balanced quite well. 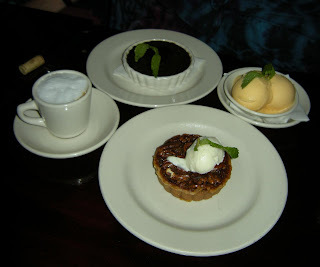 Louis had the Pecan Pie Tart with Vanilla Gelato… another dish that had me thinking of the South. 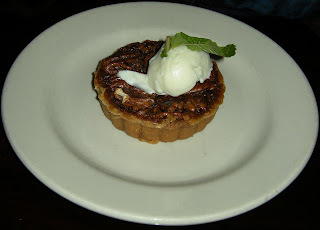 It was quite light for pecan pie, but the nutty flavor permeated the entire tart. Paul’s Chocolate Crème Brule was shockingly dark in flavor. He’s a traditionalist when it comes to Crème Brule -- we’ve had arguments over whether the substance should ever be flavored with anything but perfection. This time, though, the offering won him over. It had a rich dark chocolate flavor, but it was also surprisingly light, a good end to a good meal. But I held no jealousy when I sampled my Apricot Sorbet. The small dish of three scoops was surprisingly deceptive -- at first taste it was light and sweet, then I got punched in the mouth with apricot. I went back for another, hoping for a knockout. It was soft and cold and perfect with the lemon liqueur and my only regret is that I couldn’t have a carton shipped home for later. After two hours, we finally mustered up the will to leave, if only to collapse in our own beds rather than the comfortable corner in which we had retreated. Once in our beds, we fell into food-induced comas and dreamt of future visits. The Tuscan Grill is not the place to go if you’re looking for a quick bite to eat. It’s not for someone minding their pennies, or for a kid’s birthday party. It is a fine, intimate experience that should be shared with lovers and friends, with gusto and with no one checking a watch. 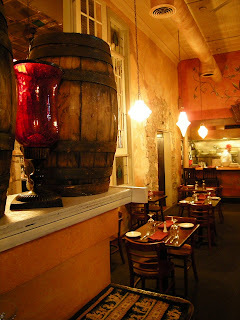 You’ll find the Tuscan Grill at 361 Moody Street in Waltham, Massachusetts. For more information, call (781) 891-5486 or check out the Tuscan Grill website.